Ohatsu,who is a prostitute from the Tenma-Ya, and Tokubei, who sells soy sauce at the Shoyu-Ya, are falling in love. However, they are unable to be in a serious relationship for complicated reasons. They decide to be together after life and commit suicide. 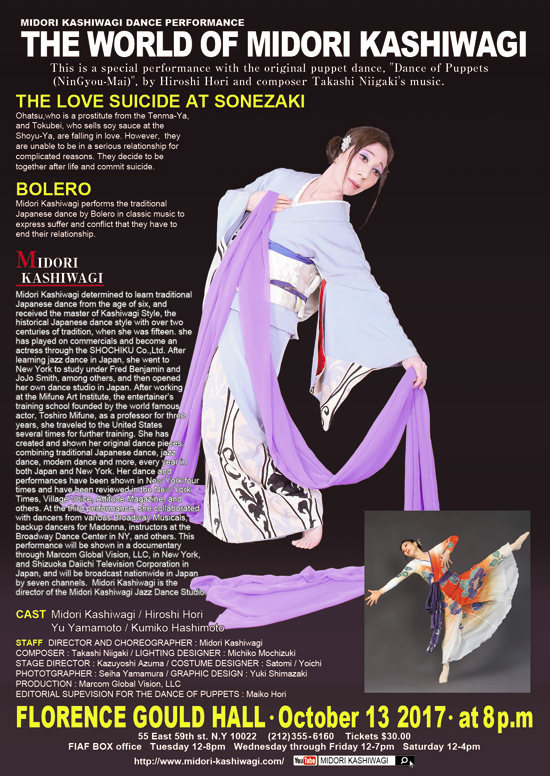 Midori Kashiwagi performs the traditional Japanese dance by Bolero in classic music to express suffer and conflict that they have to end their relationship. 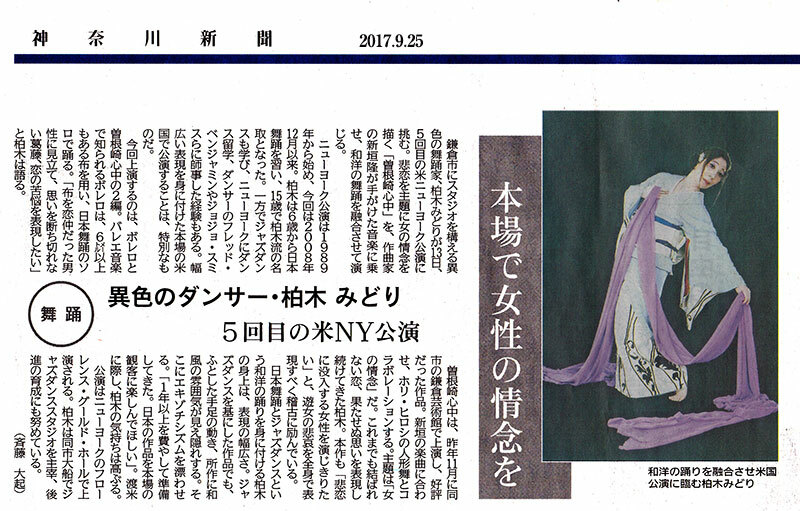 Midori Kashiwagi determined to learn traditional Japanese dance from the age of six, and received the master of Kashiwagi Style, the historical Japanese dance style with over two centuries of tradition, when she was fifteen. she has played on commercials and become an actress through the SHOCHIKU Co.,Ltd. After learning jazz dance in Japan, she went to New York to study under Fred Benjamin and JoJo Smith, among others, and then opened her own dance studio in Japan. After working at the Mifune Art Institute, the entertainer’s training school founded by the world famous actor, Toshiro Mifune, as a professor for three years, she traveled to the United States several times for further training. 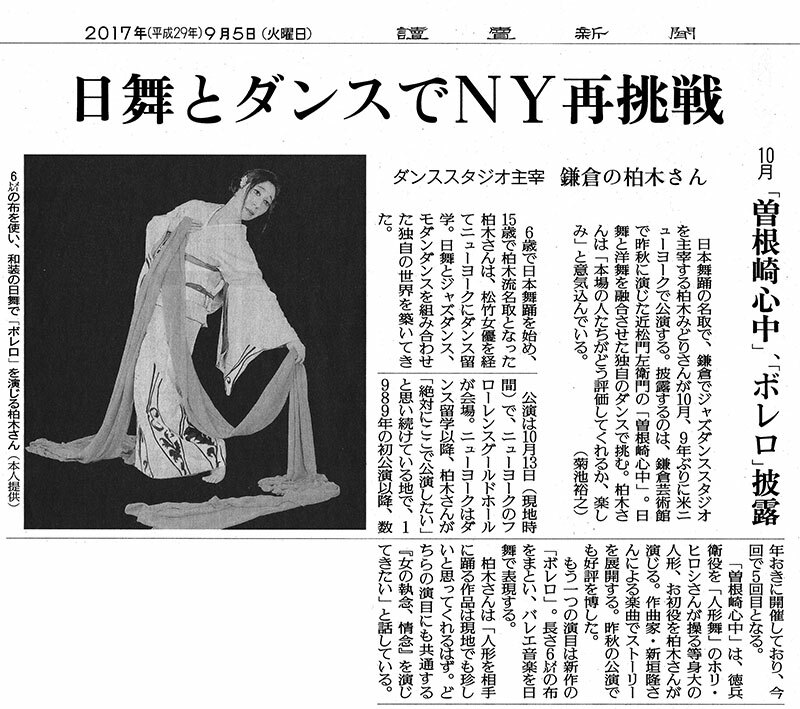 She has created and shown her original dance pieces, combining traditional Japanese dance, jazz dance, modern dance and more, every year in both Japan and New York. Her dance and performances have been shown in New York four times and have been reviewed in the New York Times, Village Voice, Attitude Magazine, and others. At the third performance, she collaborated with dancers from various Broadway Musicals, backup dancers for Madonna, instructors at the Broadway Dance Center in NY, and others. 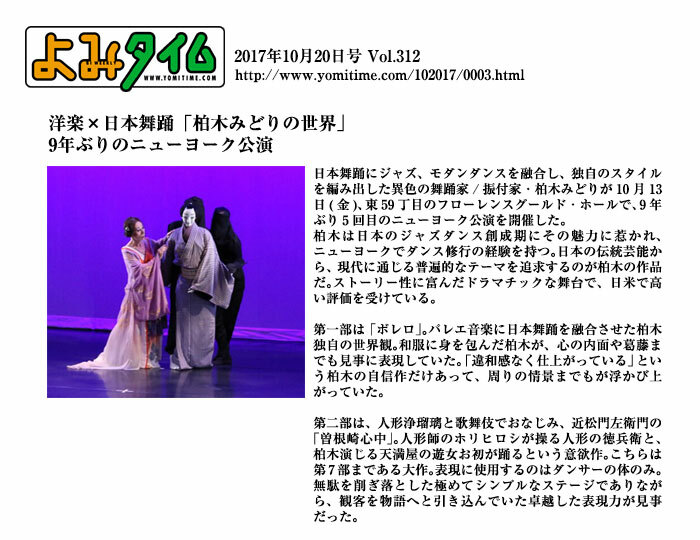 This performance will be shown in a documentary through Marcom Global Vision, LLC, in New York, and Shizuoka Daiichi Television Corporation in Japan, and will be broadcast nationwide in Japan by seven channels. Midori Kashiwagi is the director of the Midori Kashiwagi Jazz Dance Studio.